This is my entry for the American Watercolor Society for 2019. I just entered the painting yesterday, so it was in my mind in sharp detail. Today after Synagogue Services in remembrance of the Tree of Life Victims in Pittsburg I was sitting at a table having lunch and was introduced to a couple directly across from me. 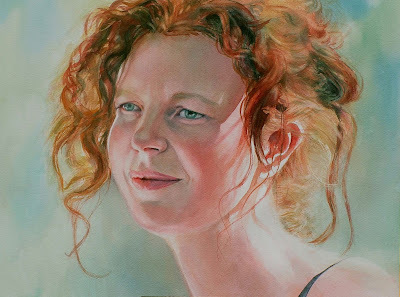 Her head was turned in this exact position with red hair, green eyes, pert nose, and eye structure, she was the woman in the painting come to life! The photo reference for the painting was taken in Paris almost 15 years ago so it must be her doppelganger. I would have loved to take a photo of my new friend but it isn't allowed in the Synagogue on the Sabbath. Next time we meet I will definitely snap a photo. The American Watercolor Society international competition is the only one I am aware of that doesn't require the entry to be painted within the last few years. Since they don't accept any mixed media in the entries, I am grateful to be able to reach back in time. So much of my current work has collaged material embedded. If you are thinking of entering, don't waste time, the deadline is fast approaching on Sunday, November 18th! This is a stunning piece and I hope you win a big award!!! Wonderful, Myrna! Looking forward to the photo of your new friend. The flesh colours of you "Rouge"painting are so frsh, thank you for sharing, and all the best! Rhonda, as my mother used to say "From your lips to God's ears!" I just hope to make the show. An award is always mind-boggling in that show. Thank you, Candy, for the generous support over the years. Thank you, Annon, for the nice comment.